Vacustep Vacuum Therapy- excellent alternative to Liposuction! You keep to your diet and exercise, yet there is hardly any success visible in the desired areas such as hips, buttocks, thighs. As soon as those fat layers have been built up a magic cycle starts: The fat cells press onto the blood vessels and interfere with a proper cleaning process of the lymph system. The inadequate blood circulation impairs the reduction of fat and the discharge of waste liquid out of the connective tissue. VacuStep specially aims at the reduction of circumference and an improvement of the skin structure in the problem zones of women. A gentle combination of vacuum and easy movement on the elliptical trainer integrated into a well shaped housing leads to the effect that the blockades in the blood vessels will be released and circulation will be improved significantly.A proper blood flow within the problem zones is the basis for a successful reduction of fat.Nutrients will be taken up by the cells much better and metabolism improves. Within a very short period of time an enormous loss of circumference and a remarkable reduction of even highly obstinate cellulite in those problem areas which are resistant to any kind of exercise result will be visible and measurable. VacuS tep reduces circumference and shapes hips, stomach, buttocks and legs. – – The vacuum ensures a better blood circulation in the lower part of the body and opens up blockades in the cells and blood vessels. 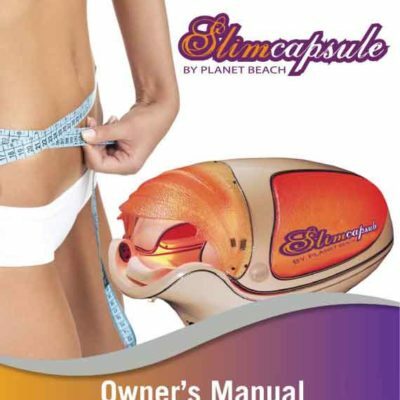 – – The fat cells will be activated and excess fat will be burnt. – – Circumference of the problem zones will be reduced significantly. – – Even obstinate cellulite will disapper. – – Musculature will be strengthened. – – The gerneral well-being will be improved and fitness increased. – – Less “cold zones” (buttocks, legs and feet) due to a better blood flow. The combination of elliptical training and vacuum activates the blood circulation (shown in red colour) in the lower part of the body. The fat cells (shown in yellow colour) open up and the released fat will be burnt. – – The first VacuStep Intensive-Training consists of 20 sessions. – – Each session takes 30 minutes. – – The exercising person affixes a rubber skirt around the waist/belly and in turn the skirt is fixed to the rim of the VacuStep housing. – – Hence the person is exercising in a vacuum which is being created by a vacuum pump installed inside the housing. – – The vacuum repositions the blood flow from the upper part of the body to the lower part and ensures an uninterrupted flow to the outer layers of the skin tissues. – – The movement on the elliptical trainer stimulates the blood circulation and ensures that the blood flows back to the upper body part. 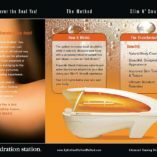 – – Blocked fat cells in the problem zones open up, the fat stored inside will be discharged, transformed into energy and burnt. – – The gentle training keeps the pulse rate always at an optimal level of fat burning. 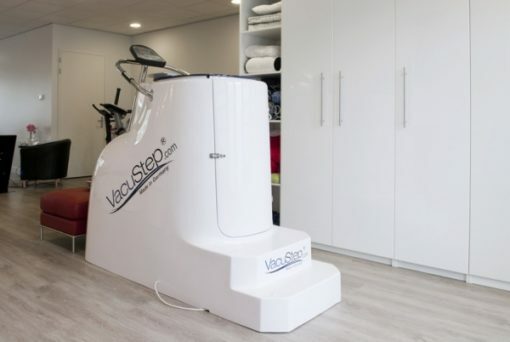 – – Compared with other fat burning programs the results with VacuStep will be achieved with far less effort and in a much shorter period of time. – – This kind of training helps regenerate the connective tissue of the skin allowing the skin to appear younger and smoother.